Arrival in Athens and depart right away to Kylini port. Boarding to the ship bound for the island of Zakynthos. Arrival and transfer to our hotel. 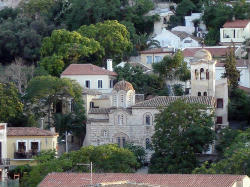 Pilgrimage to Agios Dionysios of Zakynthos. Then you get to know the idyllic landscape where the poet Dionysios Solomos inspired our national "Hymn to Freedom," on the hill Strani. Retourn to our hotel, dinner and overnight. Today we get to know the interior of the island. Full of trees, beautiful holiday regions, awesome hamlets make up the image of today's route. We will visit the church of Agia Mavra and the ruined monastery of St. John. On our return, we will visit the cosmopolitan Laganas and the beautiful beaches passing by Argassi, Vasilikos, Porto Roma and Gerekas, where the Kareta-Kareta turtles live. Dinner and overnight. After breakfast, on board will move in Kefalonia. Arrange at the hotel. In the afternoon we will worship the image of Mary in the monastery Sission and continue to the Church of the Annunciation in the Castle of St. George. The church steeple with masterly and there is valuable museum exhibits. Then we will visit the archaeological and folklore museum of Argostoli. Dinner and overnight. After breakfast we depart for a tour of the island. Pilgrimage to St. Gerasimos, visit the Cave Drogarati, Sami and cave Melissani. 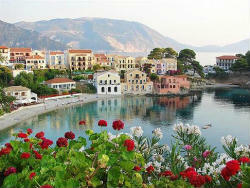 Lunch at the port of St. Euphemia, then depart for the beach of Myrtos, Assos and Fiscardo. In the afternoon we will visit the Church of the Assumption, with the miraculous icon of Our Lady "Fidiotissa." Dinner and overnight. After breakfast we will have some free time for one last walk. We will board a ferry boat to Ithaca. At noon arrival in Ithaca port Pisaetos. Check in at the hotel of our stay. In the afternoon we will visit the Monastery of Clear for Vespers. We will also visit the Transfiguration Church on the Cross which houses the relics of St. Joachim of Ithaca, the Papoulakos, as he is known. Back at the hotel, dinner and overnight. This morning we will pilgrimage at the church of the Presentation of the Blessed Virgin (Metropolitan). We will continue through a unique way to reach out to the Temple of the Virgin Mary in Anogi, built at an altitude of 500m. Then we depart from the port of Ithaca to the Port in South Lefkada and through a scenic route to the west of the island, we will cross the villages of Saint Peter, and end up Exantheia Karia where we visit the church of St. Spyridon. 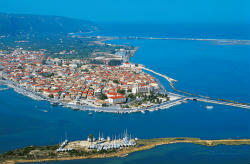 Then we will arrive to the city of Lefkada, check in at our hotel. Free time for rest. In the afternoon we will walk in the city of Lefkada where we will have the opportunity to see some of the most beautiful churches in the Ionian Islands. Dinner and overnight. 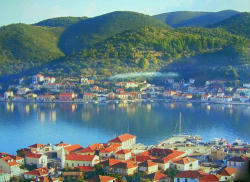 In the morning we will visit the picturesque and cosmopolitan Nidri, where we will have free time to relax and walk. Then we depart from Lefkada to Igoumenitsa from where we will take the ferry to Corfu. 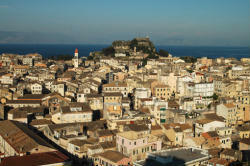 Arrival in Corfu, transfer to hotel, dinner and overnight. In the morning we will take the ship back to Igoumenitsa and then the road back to Athens. Arrival in the evening in Athens. Afternoon walk to old city of Athens - Plaka with the small houses and churches. Dinner and overnight. This morning after our breakfast we depart from our hotel to Athens airport. Departure flight back home. Office Opening Hours Monday – Friday, 09:00 – 18:00.